Attention! PDI Lodging Pirate Scam Warning: Please read! If you still need to make a hotel reservation for PDI 2015, please register to attend the PDI and a housing link will be provided. We still have rooms available at the New Orleans Marriott and Sheraton. If you have changes to an existing reservation or need to cancel a reservation at the New Orleans Marriott or Sheraton, please email the PDI Housing Company at pdihousing@rhq.com. 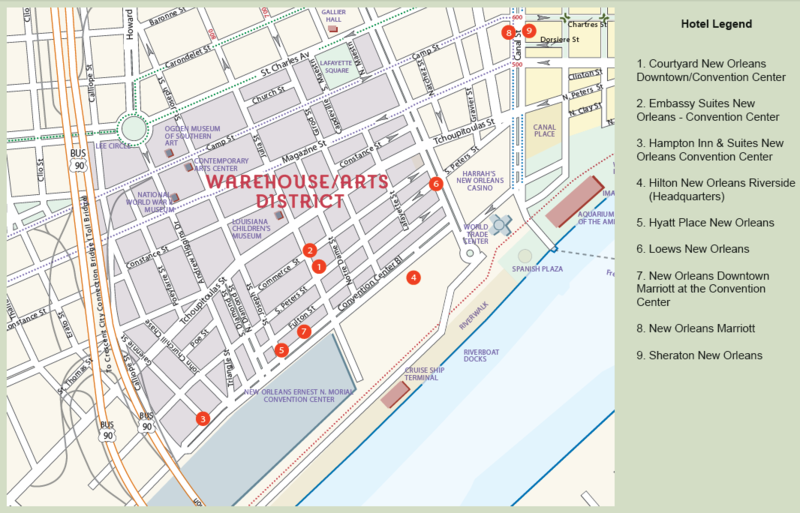 The New Orleans Ernest N. Morial Convention Center is located along the Mississippi River in downtown New Orleans with the main entrance near Hall A & B. For directions & parking information, please visit http://www.mccno.com/about-us/maps-directions/. Continuous shuttle service will be provided to and from the Marriot and Sheraton hotels: click here to view the schedule. There are over 13 commercial airlines that fly into Louis Armstrong New Orleans International Airport. For more airline information, please visit http://flymsy.com/Flight-info. ASMC has arranged a discounted rate with Airport Shuttle for round-trip airport transportation to your hotel and airport. To book your online reservation, click here! Online travel must be booked at least 24 hours prior to your flight arrival time. Please note: the discount only applies if the original reservation was made online. All official ASMC hotels are within per diem. Lodging per diem in the New Orleans area for May 2015 is $151 per night, with M&E per diem set at $71. Meals included in the registration fee are breakfast (Wednesday-Friday), lunch (Wednesday-Friday) and dinner (Wednesday). For more information on per diem, travel regulations, and tax exemption, visit http://www.gsa.gov. If you require special assistance in accordance with the Americans with Disabilities Act, please contact Libby Long at (800) 462-5637 ext. 103 between 1 March and 1 May, 2015.